This is Robertson Davies’ best book. No, really it is. And he’s written some pretty awesome ones, let me tell you. Certainly, at the very least, I can say that this one is my favourite. It has everything I want and expect from a book by Davies: a concentration on artistic and intellectual matters, exploration into the ways in which heredity and upbringing shape the soul of an individual, characters who are both ‘realistic’ and odd, witty insights into human nature and foibles at both the individual and communal level, and a preoccupation with myth as it surfaces in our everyday lives through both obvious and not so obvious avenues; in short a heady rumination on what it means to be a sensate individual living in a difficult world coming to terms with oneself all wrapped up in a wonderful story built on well-wrought prose. As the story opens we encounter our old friends Simon Darcourt, Maria Theotoky, and Arthur Cornish some years after we first met them in [b:The Rebel Angels|74405|The Rebel Angels (Cornish Trilogy, #1)|Robertson Davies|http://d.gr-assets.com/books/1170852645s/74405.jpg|1336027]. They are haggling over some problems that Darcourt is having with the inaugural work commissioned by the Cornish Foundation, meant to launch this benevolent body founded by Arthur and Maria into the world of artistic patronage. It is in fact a biography of Francis Cornish, the somewhat mysterious art collector and millionaire whose death played an important, though ancillary, role in the first volume of the Cornish trilogy. It appears as though Darcourt’s problems are two-fold: one is that there are simply too few facts for him to compose anything like the comprehensive scholarly work of biography he desires, the other is that those nuggets that he is able to intuit from the sparse facts of Cornish’s life lead him to believe that some unexpectedly provocative revelations may lie behind what on the surface had seemed a sedentary, even boring, life. Arthur wants none of it. His foundation is surely not to be launched into the world with a work whose main thesis may be that his own uncle was something of a charlatan, or at the very least a man of disingenuous aspect. Darcourt simply bemoans the fact the he is likely never to know the truth of the “rum things” that seem to lie in the background of the life and times of Francis Cornish. Luckily for the reader Davies has Zadkiel, the minor angel of biography, and Maimas, the personal daimon of Francis Cornish himself, appear on the scene to enlighten us with the true tale of his life. We are at first treated to a view of Francis’ immediate forbears, setting the scene as Maimas would have it, for the places and people that would shape him for better or worse upon his arrival in the world. Thus we meet the premier inhabits of the tiny Canadian hamlet of Blairlogie (the “jumping off point” as some might uncharitably call it): the Senator (Francis’ grandfather James McRory), a man of humble beginnings who rises to prominence in the economic and political world of turn of the century Canada due to shrewd decisions and the ability and desire to take risks, and his comfort-loving wife, Francis’ grand-mère. There is also the sweetly draconian and pious Catholic Aunt Mary-Ben, a spinster who takes over the management of the Senator’s household ostensibly to allow his wife the freedom required to fully live the life required of a society woman, and of course Francis’ parents: the Senator’s favourite daughter Mary-Jim and her very odd husband Francis “the Wooden Soldier” Cornish…the tale of their meeting and circumstances surrounding their marriage plays an important role in the first part of the narrative and ultimately sets the scene for the boy, and man, Francis is to become. Added to these ‘main players’ are the numerous background figures and servants of the prominent household, many of whom will play a much larger role in the life and development of Francis than they, or any of their ‘betters’, might have thought likely. With this the scene is set for Davies’ preoccupation with the twin pillars upon which our lives are built: nature and nurture. Francis’ life in Blairlogie is lonely and often hard. Being the sensitive and often neglected son of the most prominent family in a small rough-and-tumble backwoods town is not exactly an enviable position for a little boy, especially when you get moved to a school on the other side of the tracks. Francis’ parents and grandparents are often absent, even when they are physically near him, and so his fostering is taken over primarily by his well-meaning, though strange and often misguided Aunt Mary-Ben, as well as the servants Victoria Cameron (a staunch and somewhat harsh, though caring, Presbyterian) and the kind, but unconventional groom Zadok Hoyle. All of these people strongly shape Francis’ young mind, usually in contrary ways, so that he is pulled in several different directions by the people who should be providing him with a stable life. As far as Maimas is concerned this is all to the good, for he cannot forge a great man with the small stuff of ‘normalcy’. Also, Francis is a resourceful boy (who has luckily been ‘gifted’ with his own inspirational daimon) and is thus able to take the varied and ambiguous gifts of these people and form them into something approximating a complete, though certainly fragmented, personality. From these strange roots Francis grows an intriguing crown: a profound love of and ability in art, a deep desire to find the eternal feminine that can provide him with the comfort and love that has always been so elusive to him, and a sense of charity and compassion tempered by a love of money and somewhat cynical eye. All in all it is a foundation that Francis himself describes as “A Catholic soul in Protestant chains”. There is one other shadow-figure of supreme importance to Francis’ life and development, but I will leave the discovery of his role and identity to you from the story itself. From the small beginnings of rural Ontario Francis moves to the ‘big city’ of Toronto where he attends both Colborne College and ‘Spook’ (academic proving grounds familiar to those of us who have read more widely in Davies) before moving on to Oxford and the wider world of pre-WWII Europe. Here Francis will meet a variety of new people with whose lives and interests he will become entangled, both professionally and personally. Some will be lovers (both nurturing and destructive), others will be mentors and rivals (both very instructive roles). All of these relationships will be used by Maimas to forge Francis into the man he envisions: the ultimate work of art combining elements of both the physical and the spiritual world into an enigmatic, but complete human being. In the end Francis is led by both his interests and his connections not only into the world of art and scholarship, but also the realm of espionage and subterfuge. Ultimately he shapes himself into the skilled, knowledgeable, and supremely secretive man who is to provide such an enigmatic puzzle for the would-be biographer Darcourt. As I said in my opening this book is great. I won’t go any farther into a précis of Francis' life, Davies details it with much more colour, wit, and interest than I could manage in a review, but I have to say that Francis Cornish is a compelling character (at least as much as that equally charming rascal Dunstan Ramsay) and the story of his life is one well worth reading. 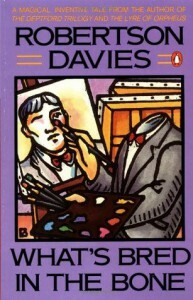 It is, I think, Davies’ tour-de-force that takes up all of his concerns and preoccupations, uniting them to the story of a life whose variety and pathos makes it both accessible and enlightening.